Thousands of protesters marched in the streets of Budapest on Friday evening as Hungarians continued to oppose Prime Minister Viktor Orban's controversial "slave law". The amended law was approved Hungarian MPs on December 12 and has now been rubber-stamped by President Janos Ader. Protesters headed to the Buda Castle, Ader's presidential palace, to show their opposition to his signing of the legislation. 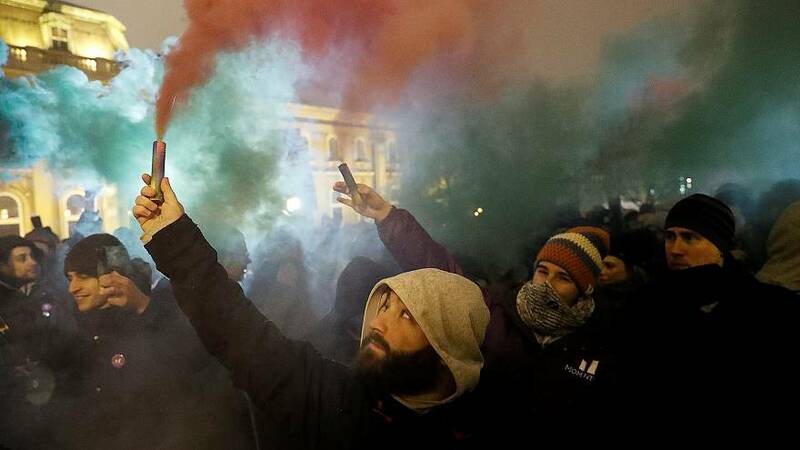 In previous protests, they had demonstrated at the Hungarian parliament and the state TV building. Hungarian Prime Minister Victor Orban said the law scraps "silly rules" and will facilitate those who want to earn more by working more. In an interview with Hungarian state radio earlier on Friday, he defended the law, saying it was opposed by people "whose lies have no limits". It will allow employers to ask staff to work up to 400 extra hours per year of overtime, compared with the current limit of 250. Protesters took part in a "peace march" led by spoof political party, the Two-Tailed Dog Party (MKKP) "to support government policies, Christmas and snowfall" — the latest in a string of demonstrations stoked by the controversial legal reforms. An "ironic peace march" started in Budapest at 6 pm CET as a cynical show of "gratitude" for what the Hungarian government did for workers. Protesters have already said that they will be back to demonstrate in January, with January 5 in the running to be the next protest date. "2019 will be the year of the resistance", Anna Donath, the vice president of the opposition party Momentum Movement, declared at the protest on Friday. Balázs Bárány, a politician from the Hungarian Socialist party MSZP, called for the president to resign. Politicians from Jobbik, LMP, Párbeszéd and Demokratikus Koalíció parties also addressed the crowd. The independent MPs Bernadett Szél and Ákos Hadházy, who were thrown out of the state TV building during demonstrations earlier this week, also attended the protest. Many spoke of solidarity and called for a general strike. The demonstration ended peacefully around 11 pm after the protesters sang the national hymn of Hungary together. Earlier this week, protesters rallied around, and even inside, the Hungarian parliament in Budapest. More than two-thirds of the Hungarian population support the protests and consider the law to be against the worker's best interests, a poll by the Publicus institute has found.